A future reality tree allows us to map out our future expectations given that we will introduce something new into our reality – the injection that we developed to break our current reality problem or core conflict. A future reality tree lets us test the future outcome using known cause and effect to check that what we want is what we will get. This page is a brief introduction, further information can be found in several published texts (1-3). 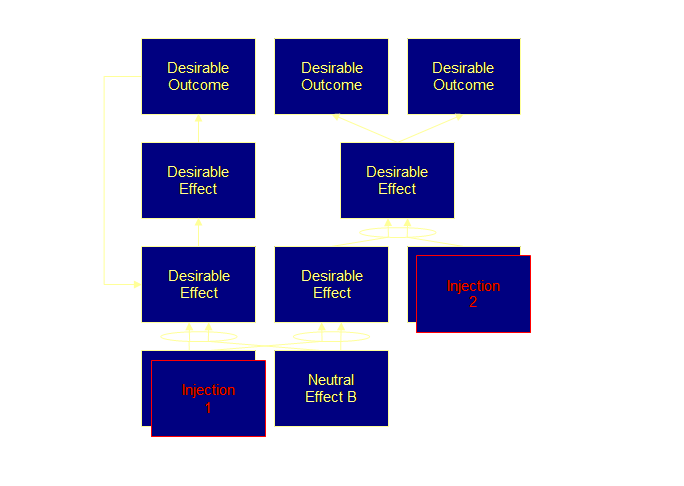 At its simplest, a future reality tree might be thought of as a current reality with all the undesirable effects (UDE’s) changed to desirable effects (DE’s). Let’s draw that. In fact we will rename the final entities as desirable outcomes. The presence of the new idea or ideas as injections will change reality from undesirable outcomes of the present to desirable outcomes of the future. Maybe we need several different injections to achieve this. The future reality tree is the tool of choice in gaining understanding and agreement that the solution we have decided upon will account for all of the undesirable effects that we currently experience and built into our current reality tree. Just as a current reality tree isn’t a current reality tree without at least one negative reinforcing loop, a future reality tree should also have a positive reinforcing loop – a so-called virtuous spiral. As things get better, they get even better still. We should try to engineer positive reinforcing loops into our future reality trees. It makes them more robust. In fact we are leveraging the situation in a positive manner. For example just as our young child had difficulty leaning to read because s/he wasn’t reading, now as the child starts to read (desirable effect) s/he can read better (desirable outcome) and then starts to read more and more often (positive reinforcing loop). We read a future reality tree in the same way as a current reality tree; if cause, then effect. While it is easiest to visualize a future reality tree like this, most often the future reality tree will not have a near 1:1 mapping with the prior current reality tree, but will grow its own shape as we engineer the solution. The important point is to make sure all of the previous UDE’s are overcome. Moreover, we want to do this with the greatest “bang for bucks.” If you find that you are using lots of injections to force the desired solution, then maybe the core problem wasn’t sufficiently uncovered in the prior analysis. For an explanation of how to construct an FRT from a core conflict and a cloud, check here. Usually as we develop our future reality tree, we experience the situation where our best intents give rise to one or more new negative outcomes. Clearly we are not aiming to introduce new problems. We call these new but presently un-realized problems “negative branches.” And we must cut them out – prune them, before we put our future reality tree into action. Let’s examine a simple negative branch example next. (1) Dettmer, H. W., (1997) Goldratt’s Theory of Constraints: a systems approach to continuous improvement. ASQC Quality Press, pp 178-235. (2) Dettmer, H. W., (1998) Breaking the constraints to world class performance. ASQ Quality Press, pp 131-156. (3) Scheinkopf, L., (1999) Thinking for a change: putting the TOC thinking processes to use. St Lucie Press/APICS series on constraint management, pp 109-141.